There are many problems that can lead to a malocclusion or “bad bite”. For example, crowding of teeth, too much space between teeth, extra or missing teeth, cross-bite, over-bite, and under-bite are all types of malocclusions. Also, various irregularities of the bone structure in the jaws and face can also lead to a malocclusion. Basically, a malocclusion is any misalignment of the teeth or incorrect relationship between the teeth of the two dental arches. Most forms of malocclusion are inherited; meaning you were born with them through no fault of their own. In addition, thumb sucking and tongue thrusting can also create a malocclusion over time. Premature loss of the baby teeth or permanent teeth, accidents, or medically related issues such as allergies or breathing problems can also cause a bad bite. 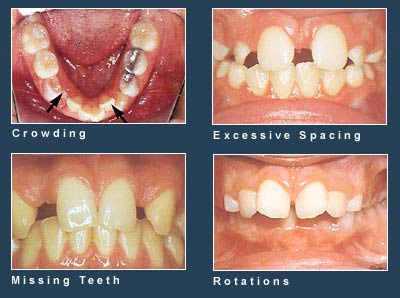 Malocclusions of one type or another are the main reason that people seek orthodontic treatment. Given all of the negative consequences just described, it is no wonder people want to get the problem “straightened out”. If you think you have a malocclusion, contact Orthodontist Dennis J. Flanagan DDS MS in his Rockford or Winnebago IL office to schedule a complimentary consultation before the situation goes from crowded to worse!